Spending two weeks in Italy we surprisingly came across Greek Salads in nearly every restaurant. While I'm not a big fan of the olives, which are usually a big part of Greek anything, I do love everything else about the salads. Internet searches provide various versions of Greek dressings, however the main ingredients seem to include: a good olive oil, red wine vinegar and lemon. Adding couscous for substance, arugula (just because I love it) and avocado to give it a California twist, I put together a version of my own which I enjoyed so much I've actually made it twice in the last week. Bring the water to a boil in a small sauce pan. Add the couscous, stir, cover and turn off the heat. After about 5 minutes the couscous will be ready to be fluffed. Set aside. While couscous is cooking mix the olive oil, vinegar, lemon and oregano. Set aside. Add the chopped tomatoes, cucumber and onion to a medium bowl. Gently stir in the dressing. Add a portion of the couscous depending on if you prefer your salad to be more veggies or more pasta. Place a handful of arugula on a plate. Drizzle with olive oil if you like, toss and sprinkle with salt. 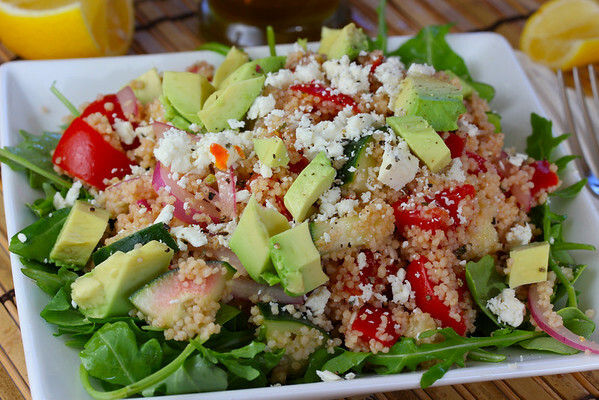 Scoop the couscous salad on top of the arugula and top with avocado and feta. Sprinkle with more salt and pepper if desired. Enjoy! A lovely salad...light and delicious. Yum...perfect after two days of heavy eating. And? Thanks for leaving out the olives...I think they're yicky too!!! this looks great - light and healthy! This does look delicious. I'd have left the olives and removed the cheese. Still not a fan. This sounds wonderful and fresh! And you are right, the perfect change from all the heavy thanksgiving food! Hope you had a great holiday :)! This looks really good! I love avocados in salads! And such vibrant colours! I love, Love, LOVE greek salads....and couscous! What a brilliant addition! Buzzed! The avocado and cous cous in this really make it stand out, whilst maintaining its quick and easy nature. Really nice - I was just trying to think of quick dinners for the week - I think a version of this will be on my week's dinner menu! Such lovely colours and so healthy. The addition of avocado is really nice. 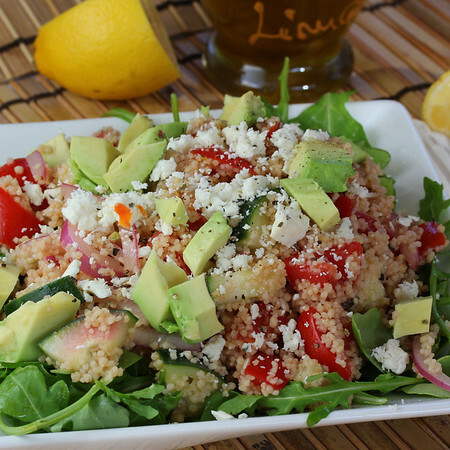 I love couscous and I can't wait to try it in this salad. YUM. i love this recipe! it's so healthy and delicious! 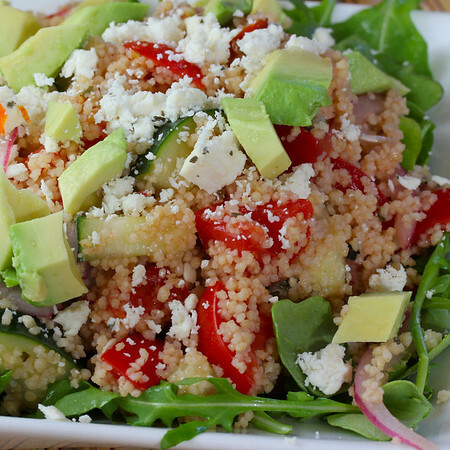 Avocados are so smooth and rich, I love the Greek spin on this couscous! Kim, isn't that funny about Greek salads in Italy? Love your Californian sunny touch with the avocado and argula. Beauty! Your salad is gorgeous, and you put your own spin on the salad, whatever is in the fridge. I love those kinds of salads, and healthy, too. Your salad looks wonderful! I have not tried couscous in a salad before. Thanks for sharing! This looks gorgeous, delicious and good for you - a perfect combination. :) Ongrats on top 9! Perfect timing on this, Kim, as I try to detox from a week of the richest food ever. I could so go for a Greek salad right now and I'm looking forward to trying your version. Cheers! That looks so fresh and delicious. A perfect dish for post Thanksgiving. Wow, that looks incredibly delicious and inviting! This looks amazing! I've been making something similar with quinoa instead of couscous - but I absolutely love the addition of arugula and avocado! Definitely making this sometime soon.